Welcome to the first day of our Mug Rug Blog Hop! We hope you enjoy the tutorial below, created by the Benartex design team, and then don't forget to scroll to the very bottom of the post to find out how to enter for a chance to win a fat quarter bundle of fabric! Hello! We're excited to be kicking off the Mug Rug Blog Hop with the sumptuous, saturated prints from Greta Lynn's Bohemian Rhapsody collection for Kanvas. These fabrics sparkle, and even better, they do all the work in the mug rugs we designed. 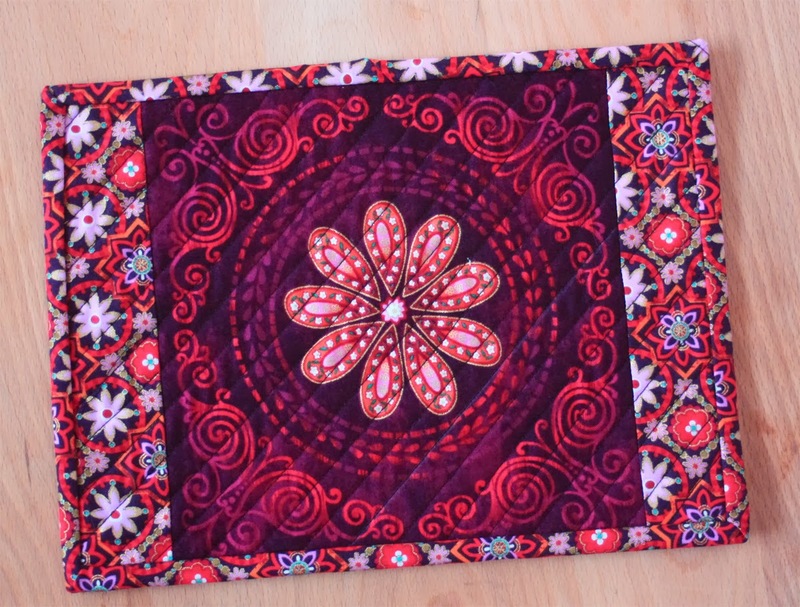 Who needs complex piecing when you can let a focal print be the star of the show/mug rug? 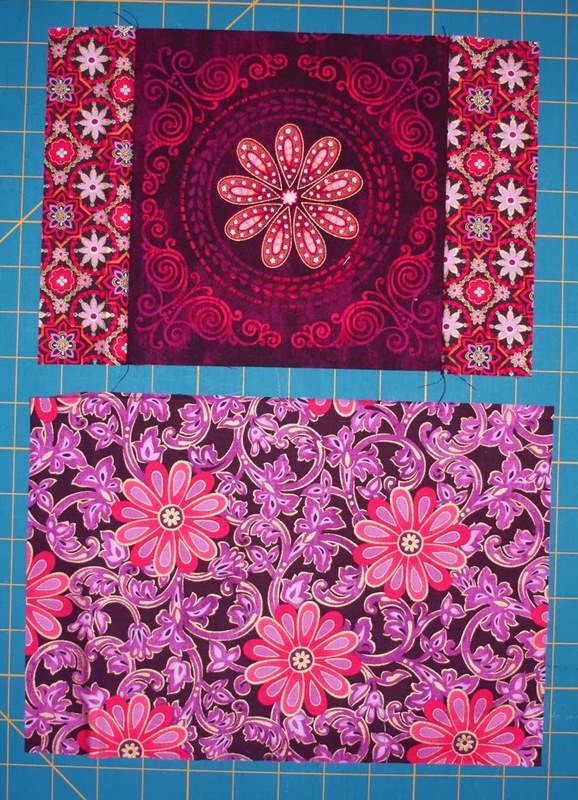 You guessed it--that medallion border print on the right had to take center stage. The hardest part? 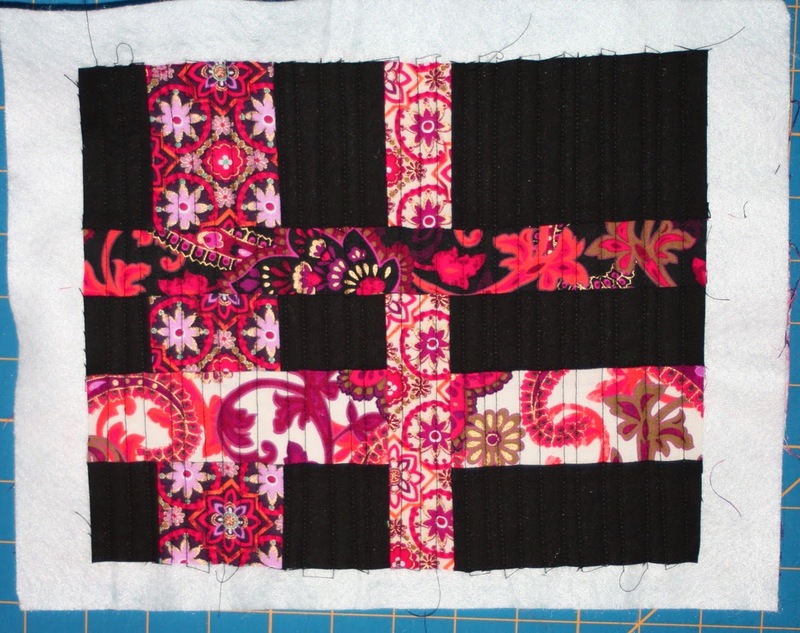 Deciding whether to use the block motif or the scalloped border stripe. Our solution? 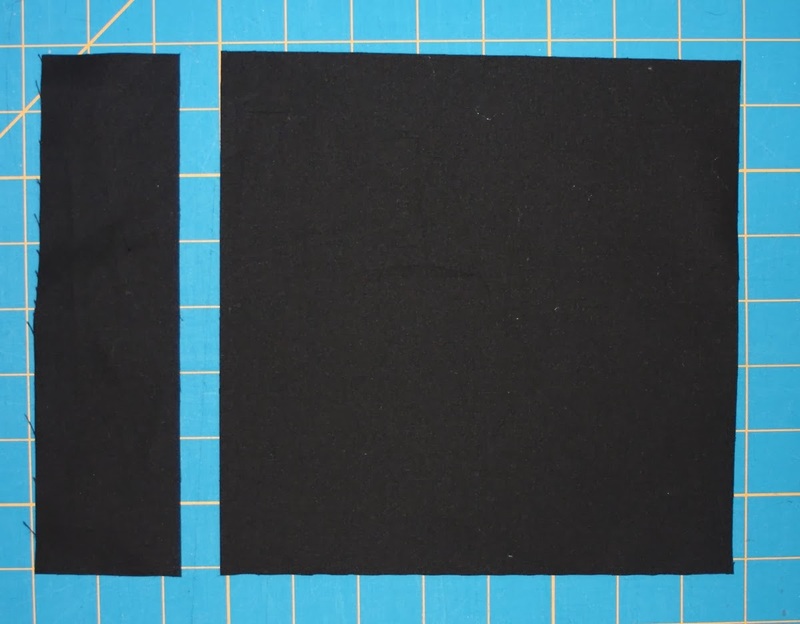 Make one mug rug using each. Create a woven look with this no-measure cut-and-piece technique. The black background makes the prints shine, and the reverse side, featuring a fussy-cut section of the border stripe, is equally appealing! 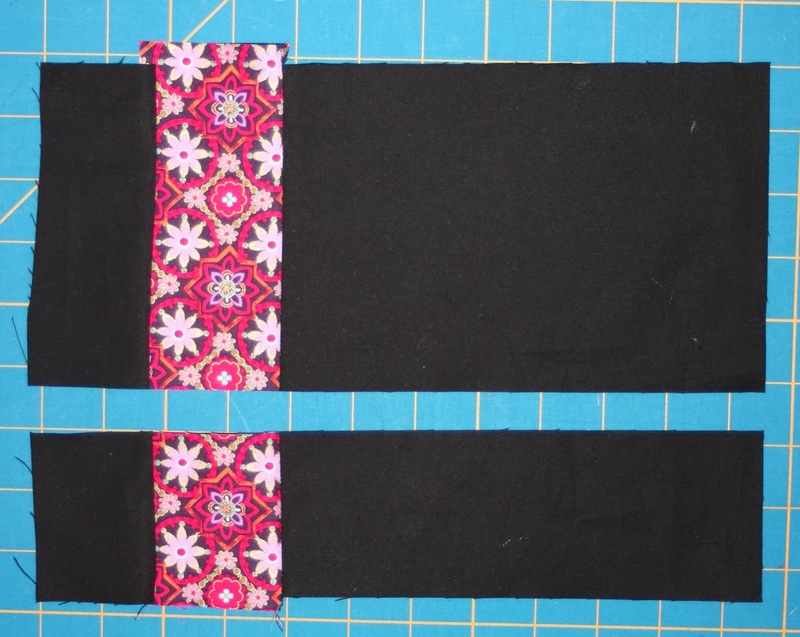 Three coordinating prints: 15" long strip of each, with widths ranging from 1-1/2" to 2"
Choose a print strip and sew between the two black pieces. 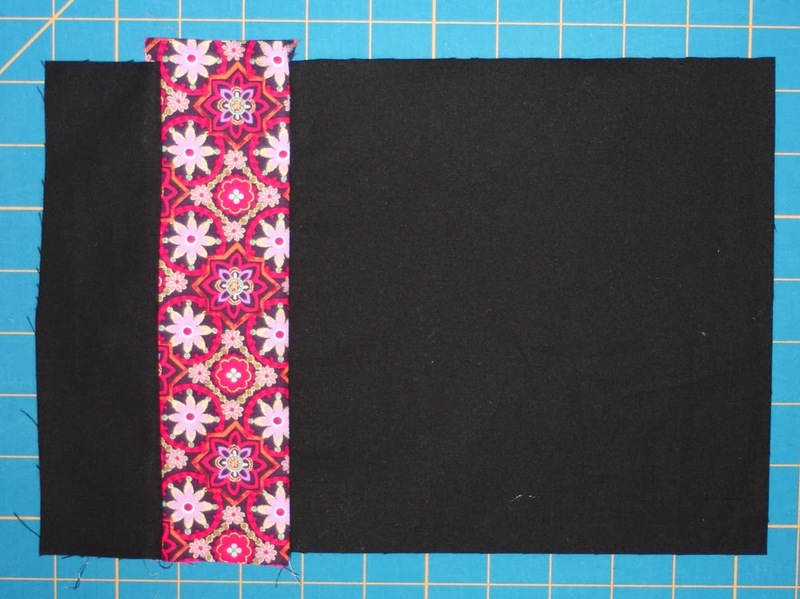 Tip: When sewing narrower strips, stitch both sides of the strip to the intended fabric pieces before pressing. It will help keep your narrow strip straight. Make a horizontal straight cut through the black piece. Sew another strip between the two pieces. 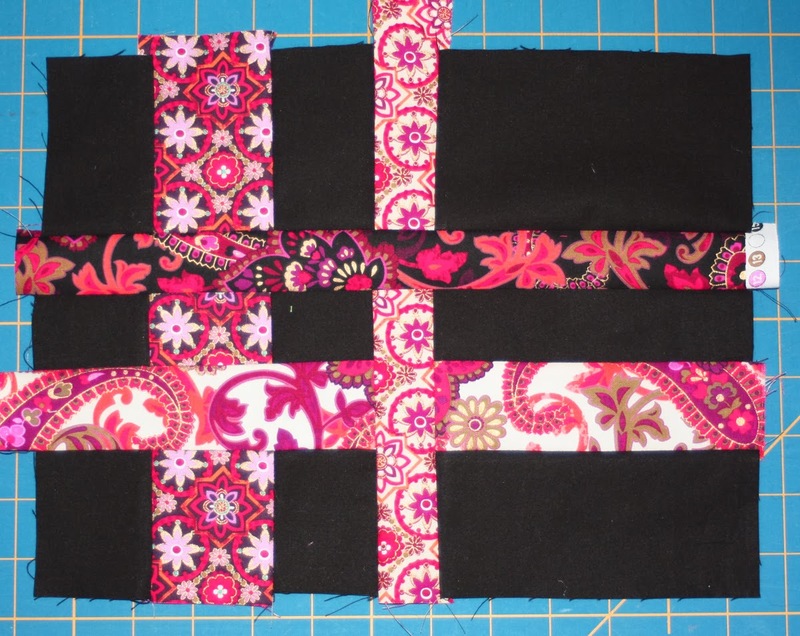 As you add the second side to a strip from now on, pin in place and doublecheck to make sure the strip you are intersecting will line up with its other half before sewing. See how the top and bottom sections of the vertical strip line up around the second added strip? Make another horizontal cut and add the fourth strip. Square up pieced top as desired--at this point, ours measured about 8" x 10". You'll need to square up again after quilting, so leave some wiggle room. 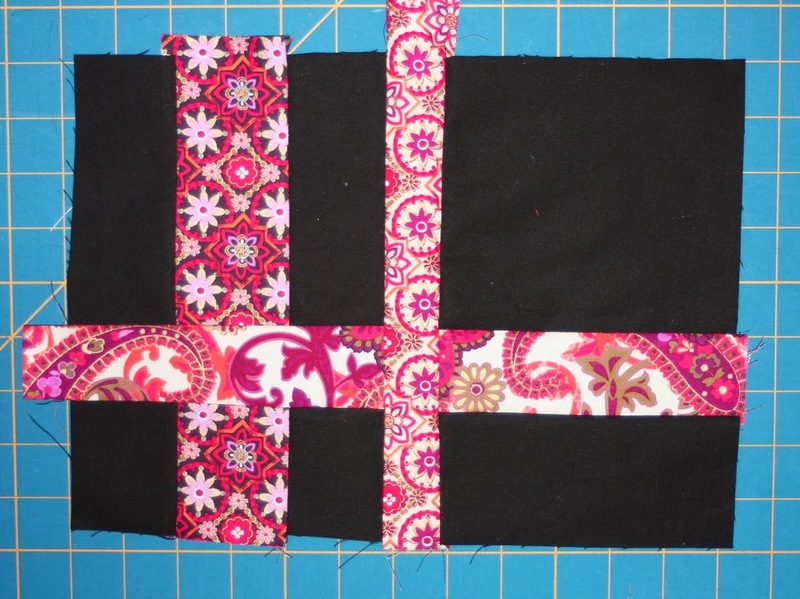 Trim up after quilting (ours measures 7-1/2" x 9-1/2") and use the 2-1/4" x 42" dark mosaic strip to bind. This mug rug is even easier! 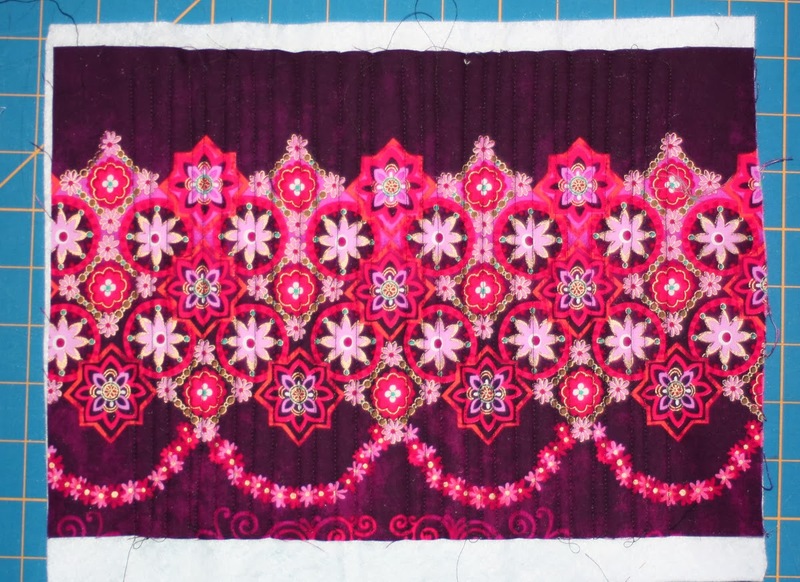 We just couldn't resist using the floral medallion motif from the border print, and the floral on the opposite side was too pretty to cut up! 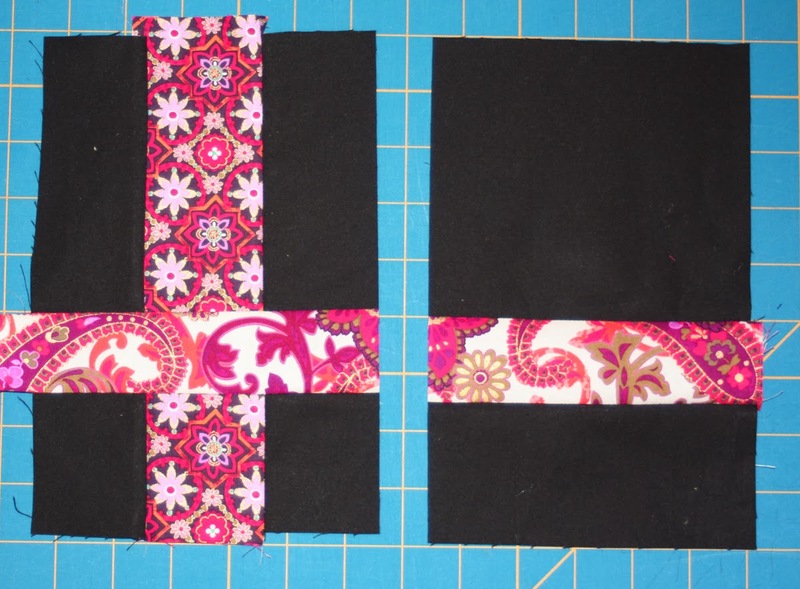 Sew 2" x 7-1/2" dark mosaic print strips to opposite sides of the 7-1/2" medallion square. Layer the backing fabric right side down, batting, and pieced top right side up. Pin baste and machine quilt as desired. Trim to square up (ours measures 7-1/4" x 9-3/4") and use the 2-1/4" x 42" dark mosaic strip to bind. You're done! Gotta love these Bohemian Rhapsody prints--both of these mug rugs are as appealing on the back as on the front! These mugs are just waiting to be filled with something...hot chocolate, perhaps? For a chance to win a fat quarter bundle of Benartex or Kanvas fabric, simply sign up to follow this blog, either through Bloglovin' (or another blog reader service) or email (both options are in the right hand sidebar) and leave a comment letting us know you follow. In your comment, also tell us what your favorite cold weather beverage is. Leave a second comment and receive a second entry by following us on Facebook and letting us know. This giveaway is open through Tuesday, February 4 at 11:59 EST. Make sure you check out all the Mug Rug tutorials! My favorite beverage is tea, any flavor but especially Chai. I follow through bloglovin. Thanks for the tutorial. A hot cup of tea, sweetened with honey. And I follow through Bloglovin. I also follow on Facebook. I think these MugRugs are wonderful. 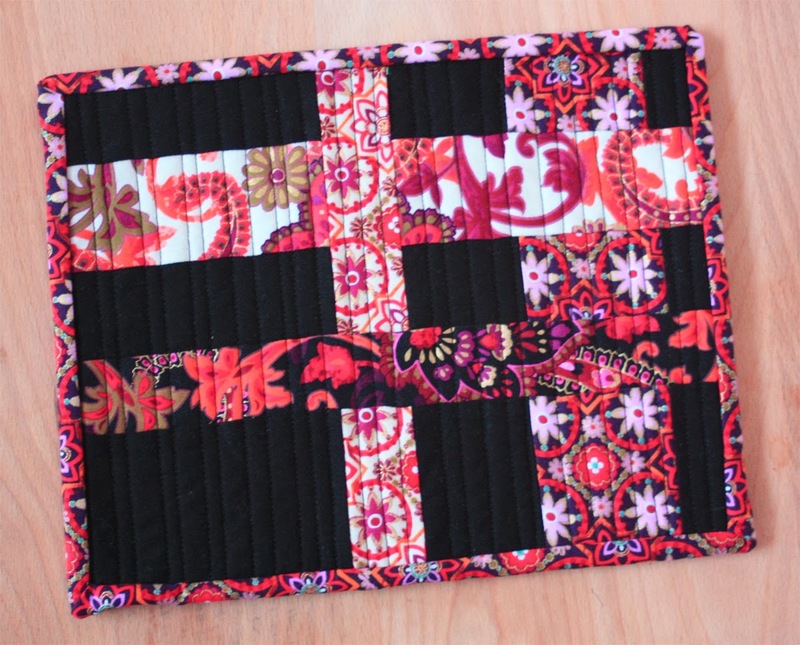 Easy and a good way to practice your quilting. Wow, what beautiful mug rugs! I follow your blog via Bloglovin. Hot chocolate is my cold weather drink, I love it. Follow/like the Bernatex Facebook page too. I follow Bernatex on Facebook. Forgot to tell you my favorite drink no matter what temp is outside is Diet Coke. Wow, such rich looking fabrics! I follow via GFC and my favorite winter beverage is coffee. Sometimes I jazz it up by mixing it with half hot chocolate. Love mug rugs! So cute and practical. My favorite hot beverage is coffee! I follow you on Bloglovin. Lovely! Great fabrics! I am a follower through bloglovin'. Oh forgt to mention! I love tea, especially black tea with milk! I follow through email updates. Cold weather beverage would be coffee for me. I follow through Bloglovin' and I am a hot tea drinker. My favorites are Irish Breakfast tea and green teas. Love thei fabric. Red is my favorite color. My favorite drink in winter and all year round is tea-with milk. I follow your blog by email. I have been wanting to make a mug rug. Thanks for the tutorials. My Favorrite cool weather drink is hot chocolate. I love a good cup of coffee and follow via bloglovin'. Beautiful fabric. Thanks for the chance to win! I follow with email and bloglovin. My cold weather drink is hot chocolate. I follow on FB too. I love making Mug Rugs and enjoyed seeing your progress. As I'm a follower please count me in. I follow by email, and my favroite cold weather beverage is tea. Thanks for the give away! I am a follower! Hot tea is my cold weather drink. Thanks! Great mug rugs - I love the woven effect of the first one! Fave drink is coffee no matter what the season! I follow with email and just signed up for bloglovin. Love the fabrics. My favorite beverage is Vienna of the International coffees, but I can't drink it in the afternoon or the caffeine keeps me awake! I could use the extra time to sew, but then I'm a wreck the next day! kspanjer(at)cableone(dot)net. I follow you with bloglovin'. Coffee is my favorite hot beverage,,,in any season! Thanks for the chance to win & for the great tutorial. I follow on Blogger - You're on my Dashboard! 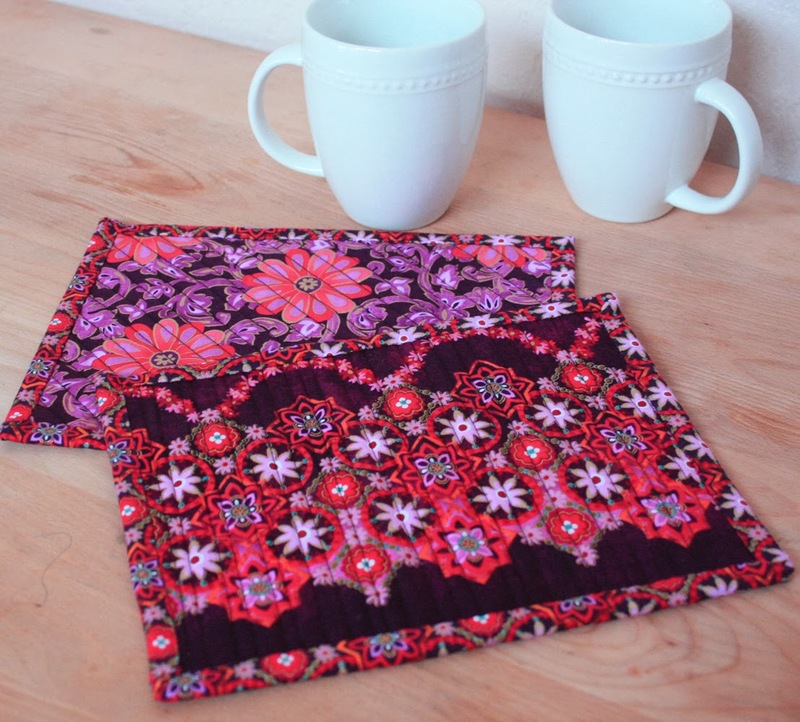 I love the mug rugs from the Bohemian fabric. A while ago I was looking for a pattern, a tute or something else to make some mug rugs. Who knew it was so easy? Thanks! I'm an email follower. For me - coffee in the morning and tea in the afternoon! I follow you via email and Bloglovin. I drink lots of hot chocolate in the wintertime. I follow on on my email (illusions@rainierconnect.com) I make a hot chocolate with coconut milk and carob, love it. I follow via email and I love hot tea in the winter. I also like your Facebook page. The mug rugs are beautiful! I follow on Bloglovin. My cold weather drink is chocolate glazed flavored coffee with chocolate raspberry creamer. I'm looking forward to following this mug rug blog hop!!! I follow by email. My favorite cold weather drink is a big cup of black coffee...maybe hot chocolate...decisions, decisions!! 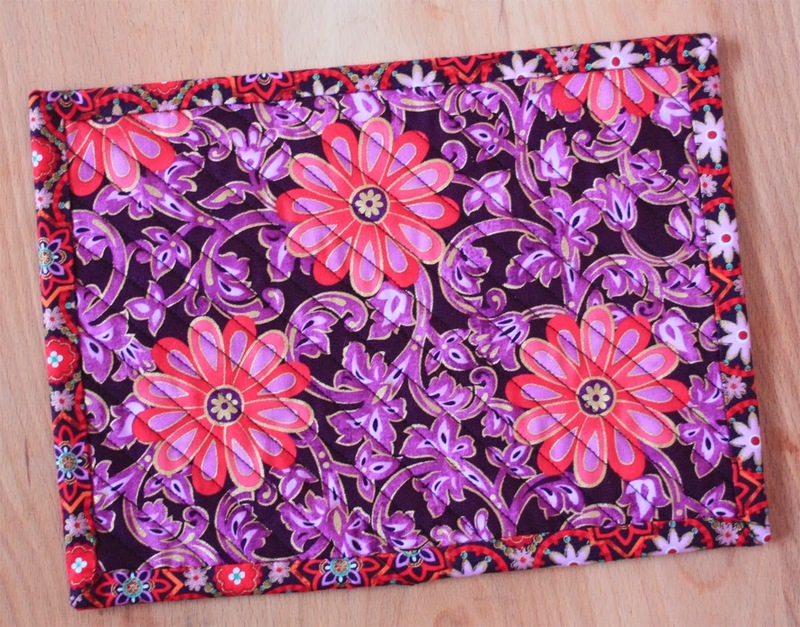 Beautiful fabric for your mug rug!! I follow your blog via Bloglovin'. My favorite beverage when it is cold is Earl Grey Tea. Thanks for the chance!!! I already like you on FB!! Love your choice of fabrics... rich and luxurious! 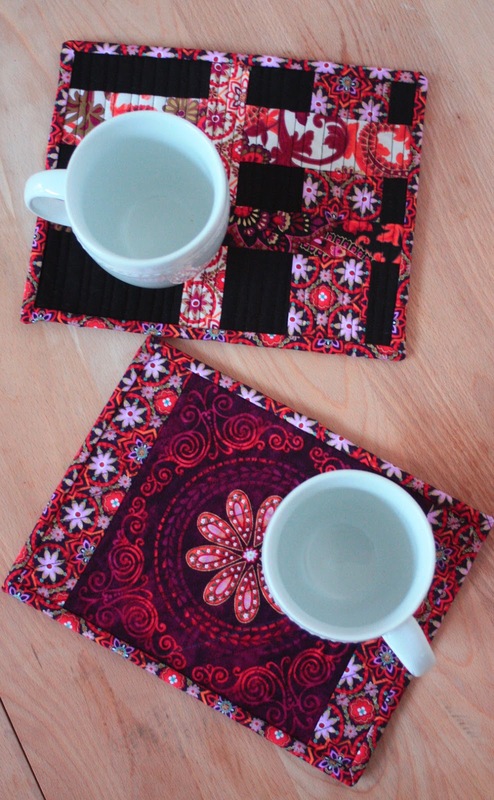 Love the fabric you used for the mug rug. I follow via email. My favorite cold weather beverage is hot, hot coffee. I follow you via email. 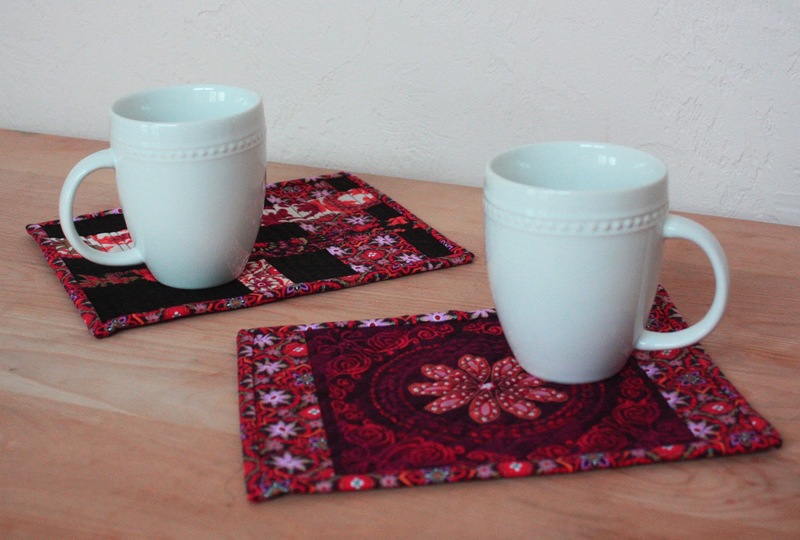 Mug Rugs have been a little favorite of mine for awhile now...makes great gifts to have on hand! Mine are not as extravagant as yours, but maybe I'll get there! I was wondering to.. 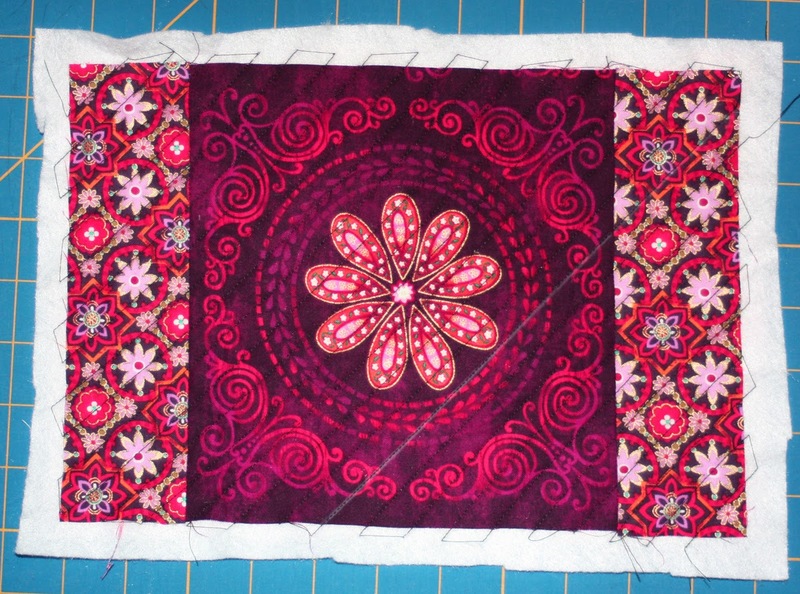 I am trying to get a blog going to share my quilting adventures, how do you have it set so just a summary shows up in an email and clicking the title to get to the blog to finish? I figure there is no sense in doing a blog, if no one gets there! Thanks for any tips! Fav beverage.. ice tea...23/7/365..rain or shine! Check your email--sending you a note about your question. I follow via email. My favorite cold weather beverage is a hot flavored tea. I definitely follow on Facebook! I follow you by email, Beautiful fabrics, I prefer bright colors. My favorite cold weather bev is hot chocolate. I follow you via email. I love chai tea all winter and in the cool mornings of summer! 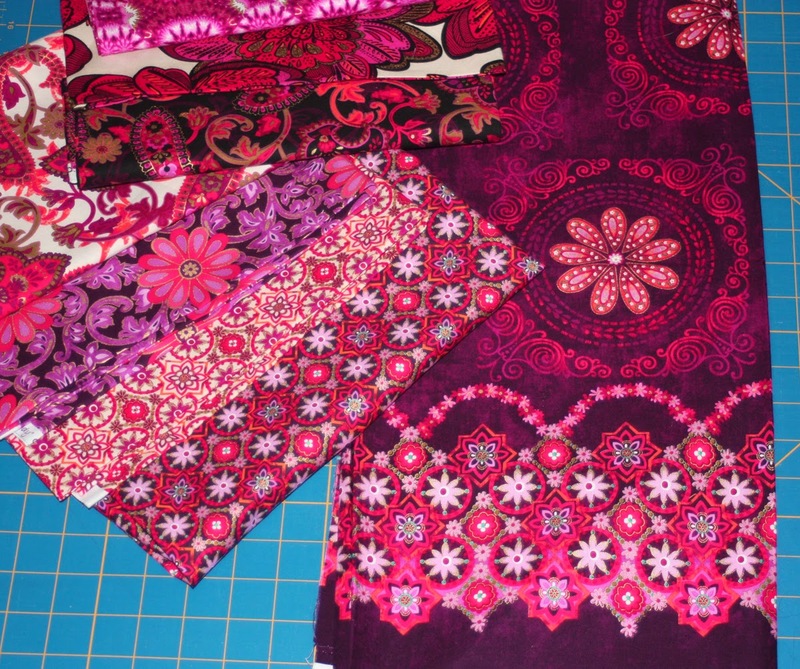 I love the Bohemian Rhapsody fabrics and the mug rugs! My favorite hot drink is hot chocolate. I'm follower on Bloglovin. Thanks for the chance to win some fabric! I follow you via email, through bloglovin, on Facebook and am a Mr. B subscriber. My favorite cold weather treat is hot chocolate and Chai Tea... during the rest of the year H2O cannot be beat! those fabrics are just gorgeous. hot chocolate is my favorite cold weather beverage. I already follow your blog through email. My favorite cold weather drink is hot chocolate. I am now following on facebook. Thanks for the giveaway! Love the work and fabric. I'm a follower and love either hot chocolate or teas in cold weather. Thanks for sharing. I am a Bloglovin follower! My favorite cold weather beverage is hot chocolate and tea. Thank you for sharing! I am a fan on Facebook also! I follow by email. I just finished a big mug of hot chocolate with whipped cream. I also follow on Facebook. Great idea, and great use of fabric. I really love this fabric. Both the color palette & the print are speaking to my heart! I follow thru e-mail. My favorite drink is a toss up between hot chocolate & Chai. Cute mug rugs! The mug rugs are gorgeous and my fav drink is hot milk with honey!! I like quick projects. I follow bloglovin. I follow by bloglovin. Thanks for the chance! My favorite is hot chocolat. My favorite cold weather beverage, at the moment, is hot tea. I have boxes and boxes of it in all kinds of flavors. I love hot chocolate too but usually only have that when I visit the bookstore. I liked the back of the first mug rug better than the front and loved the second one! Beautiful mug rugs. I follow through email and my favorite hot beverage is mint tea. Adorable mug rugs! I am a follower and my favorite cold weather drink is hot chocolate. I follow you through Bloglovin, and I enjoy a Starbucks vanilla latte as often as possible! Gorgeous fabrics! And really pretty mug rugs as well. LOVE that red!!! I am already a follower via email and also on Bloglovin'. My favorite drink (after my morning coffee of couse) is Hot Apple Cider. 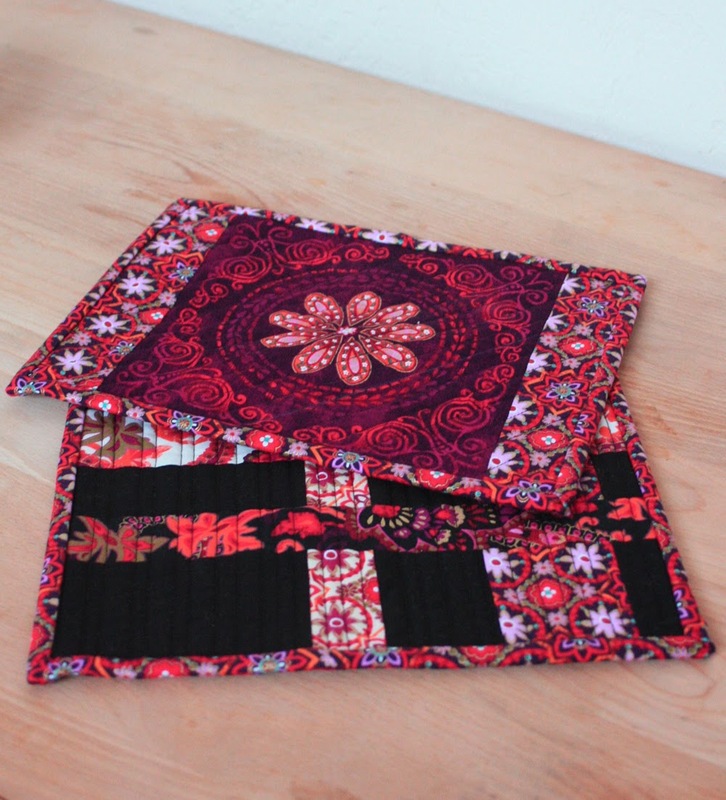 Beautiful mug rugs and beautiful fabric! Thanks for the inspiration! I follow this blog via Bloglovin and my favorite beverage is hot peppermint tea. I follow on Faebook. Thanks again! Coffee! Nice hot coffee. I already follow thru Bloglovin, don't want to miss any great fabric or projects. Love the mug rugs. I already follow you through BLoglovin'. My favorite cold weather drink is any flavor of hot cocoa! I follow you through Bloglovin'. Great mug rugs. My favorite cold weather beverage is tea…on my way to make some now, even though I have to admit here in Ca, it never gets as cold as the east coast! I follow you via Bloglovin and email. That way I'm sure I don't miss a thing! My favorite cold weather beverage is Earl Grey green tea with bergamot! I have a cup every night. Bloglovin and hot chocolate. A great combination for a cool evening read. Definitely hot chocolate :-) I follow on Bloglovin! and on facebook! My fav is coffee--cant live without it! I follow with bloglovin! I'm not picky -- coffee, hot chocolate, hot chai latte. I have been following you on Bloglovin'. Hot chocolate with whipped cream! Yum! Love the mug rug and the fabric used!! I liked you on FB a long time ago! I follow via Bloglovin'. I think my favorite cold weather beverage is hot chocolate with marshmallows. I follow via e-mail. I love some hot tea. Oh my gosh, I just realized I never left the 2nd comment. I am already a follower on Facebook. Hi!!! I am a follower on bloglovin!!!! I love coffee coffee coffee!!!! Gotta have it!!!! I follow your blog through email. My favorite cold weather beverage is tea. I love Lady Grey in the afternoon whilst I'm working on a quilt. I follow through email. My favorite cold weather beverage used to be hot cocoa but then I found coffee two years ago and haven't stopped drinking since. I follow by email. My favorite winter beverage is hot blueberry tea! I follow on FaceBook. My favorite cold weather drink is hot tea. I follow via Bloglovin and my favorite winter beverage is hot tea. I love the mug rugs. I also follow via email. I follow your blog on Facebook and love this blog hop. I love both hot coffee and hot tea and drink both each day. Coffee in the AM and tea in the PM. Hot chocolate is a treat I enjoy in between. I follow your blog via email. My favorite cold weather beverage is hot tea. I am also fond of hot chocolate. I follow your blog on email, am a preview pack member and follow on Facebook. I can't wait to try that technique for the braided rug, it looks awesome. That Rhapsody fabric is my favorite. I follow via email and my favorite cold weather drink is hot chocolate! My favorite cold weather drink is hot chocolate! Love this fabric, follow on bloglovin and I drink a nice Hot Chocolate. I follow through bloglovin, and I love to drink hot chocolate! I follow on FB as Kathy Newsom Davis. Following through blog lovin. Love anything hot from Starbucks. So happy I found this blog hop! Really love these mugrugs! I now follow on facebook. Follow via bloglovin'. My favorite is coffee. Love this fabric. I follow by email. I liked you on FB quite a while ago. Love the fabrics and the mug rugs!!! I follow by email. My favorite cold weather beverage is hot chocolate. LOVE HOT APPLE CIDER IN WINTER! HI, follow you on FB too! Love this Post and all your neat ideas ! I'm a follower with Bloglovin'. Hot tea is my favorite cold weather beverage. Thanks. I also follow you on FB. Thanks again. I follow you by email. This time of year calls for hot tea! 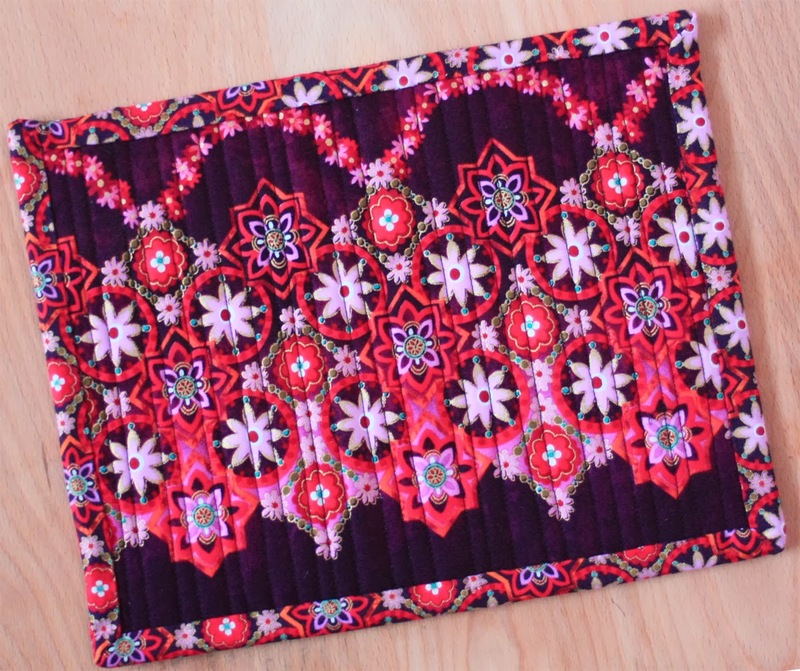 I love how the fabric was used in this pretty mug rug. I'd say the best drink is hot chocolate with marshmallows. I follow on Bloglovin. I follow via email... My favorite beverage is tea, especially a nice hot cup of herbal or mint in the winter. I follow already by Google Friend Connect and my fav beverage at any time is Coffee. I follow via e-mail. My favorite drink for this time of year is hot chocolate. I follow on blog lovin. I Love a good mug of hot chocolate during the cold winter. Love your mug rugs! I have yet to make one but Hope to soon. Thanks for sharing yours and the tutorial. I like you on Facebook....and I forgot to mention (above) that my favorite color weather drink is coffee. Feeling frosty? Or just frozen?